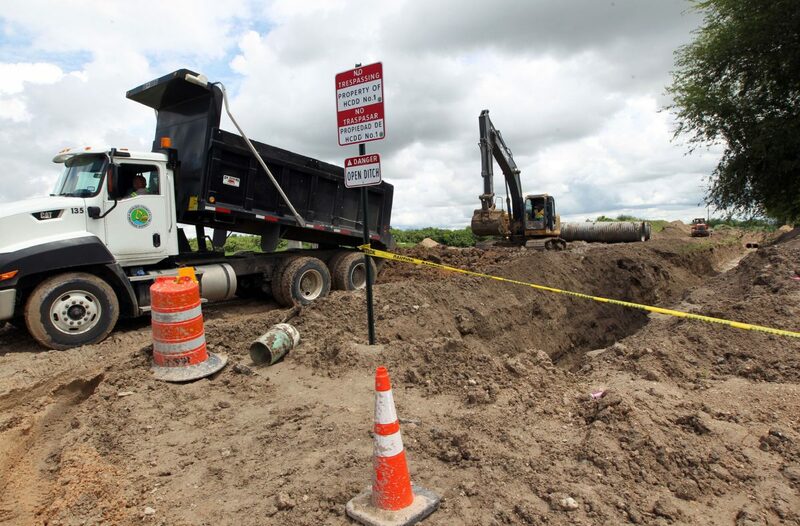 McALLEN — Valley Interfaith, a religious-based non-profit organization, declared its support Friday of a proposed $190 million bond to upgrade the drainage system in Hidalgo County. Hidalgo County Drainage District No. 1 board of directors, which services all residents in the county, called for the bond election to be held in November. The board, composed of county commissioners, moved to hold a bond election to address drainage after areas of the county sustained major flooding in June. Valley Interfaith leaders, such as Eddie Anaya, who represents South Pharr and attends St. Frances Cabrini Catholic Church, requested drainage improvements benefit the Las Milpas area. The drainage district plans to allocate $1.9 million to the Las Milpas area, located in Precinct 2, for the widening of ditches flowing into the South Lateral Drain, according to a drainage district fact sheet distributed at town hall meetings. Leaders of the nonprofit organization decided that approval of the bond would be in the “best interest of the families who had been flooded,” Anaya said. Several areas of the county were hit with a foot of rain, which seeped into thousands of homes. The drainage district will take on $190 million in debt, if voters approve the bond, for drainage improvements and the purchasing of machinery and equipment for its maintenance. Property owners in the county will pay an additional 3 cents per $100 property valuation, according to information provided by the district. The district’s tax rate is currently set at .0951 cents per $100 property valuation. A property owner with a home valued at $100,000 would pay an additional $30 in taxes, bringing their total assessed tax by the district to $125. “We listen to the gospel, but we put action into that,” Anaya said, noting Valley Interfaith has been encouraging voters to become familiar with issues on the ballot, including the bond proposition. Luczak has been encouraging parishioners to register to vote and become knowledgeable about issues on the ballot so they “can make their own informed decisions,” he said. Most importantly, he said, registered voters should “get to the polls” to cast ballots. Valley Interfaith has supported other issues in the past, including the hospital district. They also opposed the construction of a border wall, according to Monitor archives. Organization leaders also attended a city of McAllen meeting in June, to advocate for drainage improvements. Early voting begins Monday and ends Friday, Nov. 2. Election Day is Nov. 6.